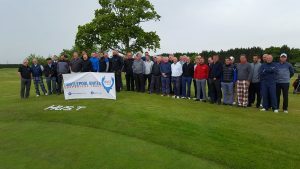 On the 25th May 2018 HUST were joined by a raft of Poolie legends, local companies and Pools supporters for a Golf day at the prestigious Wynyard Golf Club, Wynyard. The main event sponsored by Bristol Street Motors Hyundai featured 22 teams of three golfers each with a former Pools star making the 4th ball. After a hot drink and bacon bun the golfers headed out for probably their wettest round of golf ever, playing the shotgun start 18 holes before returning the club house to dry off for dinner. After food the attendees were entertained by fantastic comedian Martin Gold. The event raised funds directly for HUST while raising the profile of the organisation and HUST would like to thank all of those involved, especially the main event and hole sponsors and the ex-Poolies for taking part. The attendees prior to the rain!